When did dances get this complicated? If you’ve just joined us (thank you, by the way), the Editor in Chief, Executive Editor, Head Writer, Creative Director, Best Boy and the entire Pencil Sharpening Team here at IBMP took a break from the Interwebs for a few weeks. Upon returning, I was pleased to see the universe remains largely as I left it: people on Twitter still like bacon and coffee, someone on Facebook got her hair done and was OMG sooo freaked out!, there was a picture of someone’s lunch on Pinterest and a mommy blogger gave away something she was SO EXCITED to be giving away. In other not-so-breaking news: my son still has selective hearing, my wife is still better at everything than I, and my dog still secretly laughs at me when my back is turned. All is right with the world. I also learned, on the night I returned, that 6th-grade dances have evolved since I was that age. First of all, they say there are no drugs allowed at the dance but then they sell the kids every type of candy and sugar drink imaginable. When my son asks for $20 for food at the dance, my first—and clearly naive—assumption is that he’s going to spend it on, well, food. And I’m sure he would if they actually sold food at the dance. Twenty dollars buys a lot of Twix and Coke. 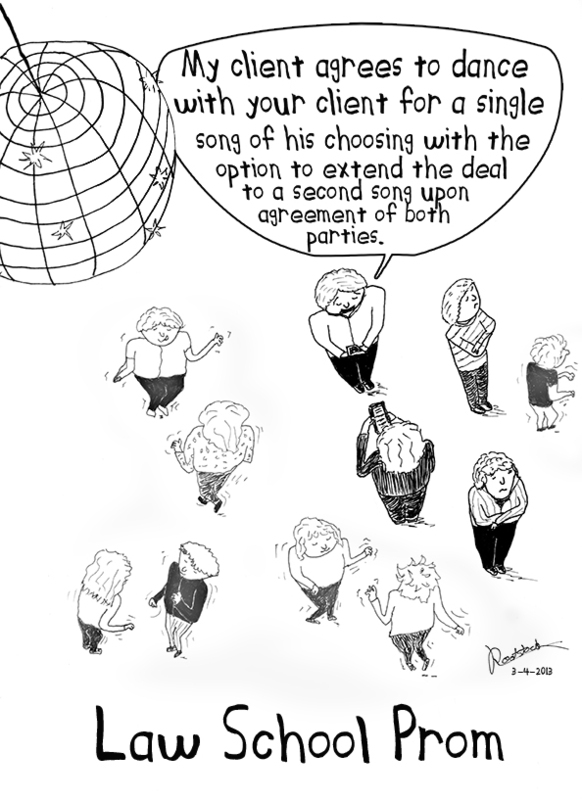 The second major evolution has to do with the market for dance partners. Dancing used to require only 2 people who were aptly named the “dancers.” One would ask and if the other agreed to the terms, they would then advance to the dance floor. There were no support personnel. Apparently, today’s savvy dancers know that if you want to dance with the best, you’ll need someone experienced and well-connected on your team, someone who knows how to get you in front of the right potential dance partners. Hey dad, at the dance last week, guess what. Um, what, you actually spent less than 50 bucks on candy? No. Well, yes. I guess. But no that’s not it. You actually asked someone to dance? No, I did. Two people, actually. Whoa, cool. People you know? No. One had a boyfriend but the other said OK. Awesome. What was her name? How would I know? I told you I didn’t know her. I don’t know, I guess I thought you might, oh, maybe ask her name. Anyway, that’s not it either. I hug danced! Wow! You asked a girl to hug dance! No, I didn’t ask. No. Geez, dad. No! Oh, right, of course. So who asked you? Some guy I’ve never met before. Wow, someone you’ve never met asked you to— wait, some GUY? Dude, I mean, not that there’s anything wrong with that. It’s just that, I don’t know. Really? I don’t think any of the books we got you cover that, um, stuff. What did you say? Well I didn’t hear him say “hug”. I thought he just said “dance” so I said “yes”. Did it seem strange to you that a boy was asking you to dance? Naw, it happens all the time. Just to you, or to other people too? So boys dance with boys all the time at these dances? I mean, not that there’s anything wrong with that. Ew! Geez dad, no! Ew. So a boy asked you to dance and you said yes but you didn’t dance with him? Why would I dance with HIM? Um, because he asked and you said yes…? I just know when I was your age a request to dance followed by an agreement to dance usually resulted in actually, you know, dancing. Well I DID dance but with the girl. Yeah, the girl he asked me to dance with. Duh. Ah, so the boy was asking on her behalf, like some kind of a dance broker or something. Yeah. I thought you said you used to go to dances when you were a kid. Sure, but I don’t remember girls having formal representation. That girl’s got an agent. So do you have her people talk to your people? Maybe do lunch or something and work out some kind of win-win arrangement? A deal for two hug dances with the option to extend the contract? Never mind. How was the hug dance? Works for me. How about lunch? Wow – things have changed! I remember boys and girls just standing on opposite sides of the room leering at each other. People would only dance if everyone got on the dance floor too. That’s what I remember, too. My son danced 10 times that night and in only a couple of those was the person who asked him also the dancer. Weird. I had to laugh at the conversation – talk about a comedy of confusion!! Trust me, that’s how 95% of our conversations go. Glad you found it funny! TYVM. Yup. And then it was just a big group thing, not face-to-face actually having to look at your partner type dancing. They do two kinds of dancing at the dances here: hug dancing (what you’d imagine it to be) and “regular” dancing which is actually boy’s hands on girl’s hips, girl’s hands on boy’s shoulders and then rocking back and forth like penguins. That’s it. And basically, if they aren’t getting buzzed on candy they’re actually dancing. Barmy’s back! I couldn’t be happier. I too have been out of the loop a bit, but, I still missed ya. I grew up in rural south-west Ohio and those dances were, well, bizarro. It was the seventies and disco and rock and hippies and… oh, God, flashback. It’s fun to hear you talk about your son because mine are younger and I like knowing what’s to come. I’m glad you’re happy and I really do hope you win that toaster soon. Your conversation was too funny! I thought school dances were complicated enough when I was in school. And that was only in the ’90’s. We had Much Music do a video dance party in junior high. We just sat on the floor watching the music videos all night..
That’s what we used to do…a few decades earlier, but since we didn’t have Much Music videos to watch, we had to sit on the floor and watch the football team captain rotate through the cheerleaders one song at a time. Pretty much the same thing as Much Music only the football captain and the cheerleaders weren’t dancing in their underwear. There is officially a middle-man at junior high dances – awesome. After reading, and remembering my middle school dances I have decided to home school my daughter. Probably a wise choice. Home schooling through senior year at university is always the ideal to work towards. girls nowadays would probably ask their crush to have a dance with him. ang if they are shy, they’ll ask a friend to tell him. Lol, I must live on the wrong side of the world as this is very familiar to me. We never asked directly, always had a friend ask for you and that was in the eighties. Hi.I’m Corey I’m new to blogging. Please go follow my page mypain120’s blog. Thank you. I would really appreciate it. Wow that’s really cool. Dances are so awkward for some people especially the first dance. I remember the boys being on one side and the girls being on another side. Completely separated. Of course, we still had the couple who wasn’t shy and immediately just started dancing. While everyone watched them in fear. It’s always a great first experience.